Colors mesmerize me, be it the rainbows formed due to interfaith hugging of green and vermilion gulal with purple water sprouting out of pichkaris on holi or the rainbow formed in the puddles in monsoon. Hyderabad is one of the most colorful cities in the country perhaps rivaled only by Jaipur, which obviously has a bias towards pink. 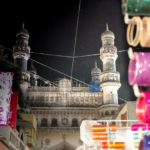 But Hyderabad has no such bias it loves all its colors the black burqas of Khatoons from the old city to the Ochre dupattas and multicolored mangal sutras of Marwari ladies shopping in begum bazaar. 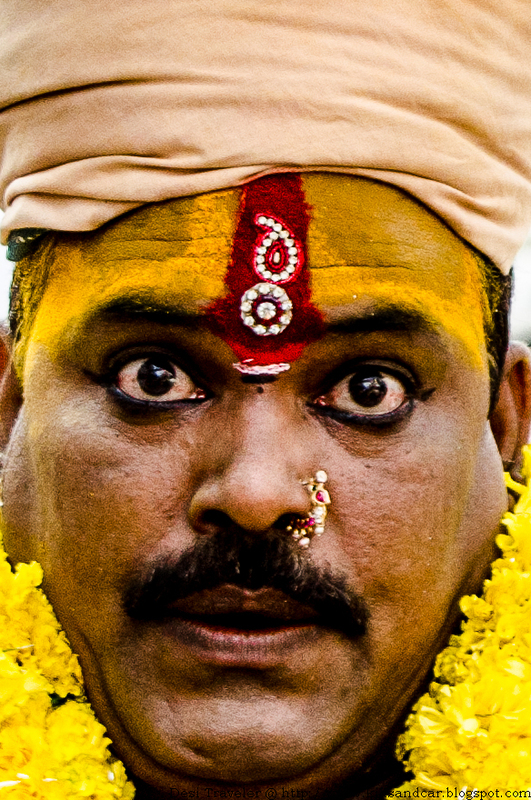 But nothing has prepared me for kaleidoscopic Bonalu. As part of Hyderabad Weekend Shoots, I joined a walk this Sunday for Bonalu festival at the Ujjaini Mahakali Temple in Secundrabad. 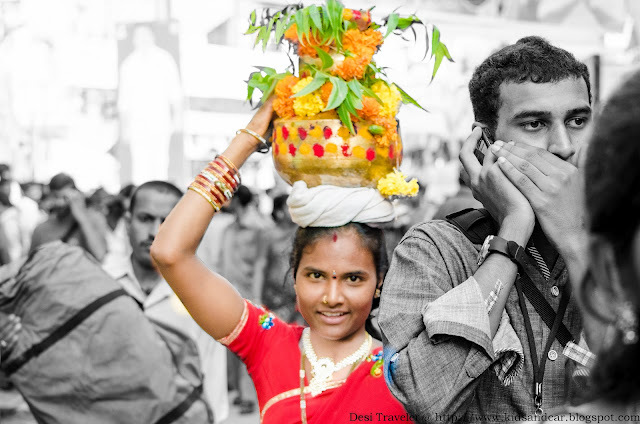 Bonalu is a local festival of Telangana region dedicated to Mother Goddess and is celebrated during the Hindu calendar month of Ashada (the same month Kalidas celebrated in his epic Meghdutam). 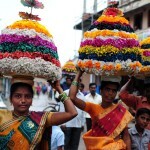 Bonam means Bojanaalu or a meal in Telugu, is an offering to the Mother Goddess. Women bring cooked rice with milk, sugar sometimes onions in a brass or earthen pot, adorned with small neem (Azhardicta indica) branches and turmeric, vermilion (kumkum) or Kadi (white chalk) and a lamp on the top. 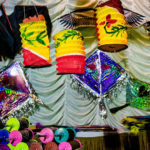 Women place the pots on their heads and take it to Goddess temple, led by drummers and dancing men high on the toddy that is consumed liberally. 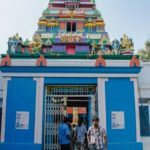 Sri Ujjaini Mahankali Temple is an important temple dedicated to Shakti worship in Telangana. As the legend goes the deity was installed here in the beginning of 19th century by some devotees from Ujjain in Madhya Pradesh. There were more than 40 photographers, but that was no match for the numbers in which the believers have shown up, hence I never got the opportunity to enter the temple, perhaps it is true when they say “you don’t go to the temple, the mother goddess calls you” so I am sure my day to visit temple will come but today was not that day. 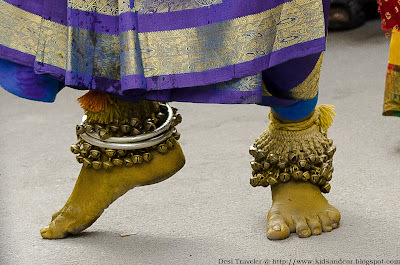 The colors of Bonalu are a feast for eyes, kids, and women clad in their finest clothes and jewelry, with colourful flowers in the hair were for a change getting competition from men in colourful dhoti’s and painted face to depict various demons that the Kali had destroyed in the epics that I grew on, long before imported superheroes made their debut at Indian box office. All this led to a very colorful morning though the sea of colors was occasionally polluted by the dirty white of the politicians visiting the temple, leaving stranded and waiting for the very people who have voted them to power. Unfortunately, I could not stay for very long and missed the evening festivities, but I am pretty sure Maa willing I will be back next year. Thanks for reading check more photos by clicking here on t his link. Do leave your comments and like the Facebook page of Desi Traveler by visiting this link here. Hope you do get to enter the temple, nice coverage of the festival though. I now see this post is from long back, have you been to the temple yet? No, I never got the chance to enter the temple, but I have been to the other famous and older Kali Temple in Golconda fort Hyderabad. Great pictures. There does seem to be a festival of colour alright. Hopefully you will make the temple the next time. Thanks a lot Ross… and welcome to desi Traveler.. Thanks Ross, and welcome to desi Traveler…. Good… I will remember that if I face issue in future. Prasad you’ve beautifully captured the colours of the festival! Thanks Vetrimagal,,, it was an eyeopener for me.. as I have been in Hyderabad for 3 years and never participated in it till date. I guess slowly I am learning about the city I call home now. 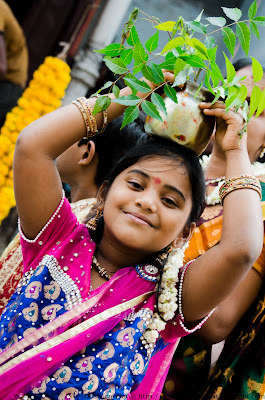 Nice to read about Bonalu in an English blog, with some vibrant pictures. This festival is something we take for granted in Secunderabad and enjoy the sights and sounds.